The U.S. 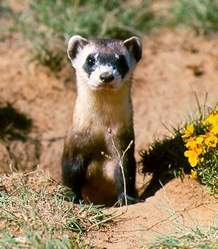 Fish and Wildlife Service is announcing the availability of the black-footed ferret Revised Recovery Plan. The black-footed ferret was historically found throughout the Great Plains, mountain basins and semi-arid grasslands of North America wherever prairie dogs occurred. The species is listed as endangered under the Endangered Species Act of 1973. The ferret’s close association with prairie dogs is an important factor in its decline. From the late 1800s to approximately the 1960s, conversion of native grasslands to cropland as well as poisoning and disease dramatically reduced prairie dog numbers. The ferret population declined as a result.